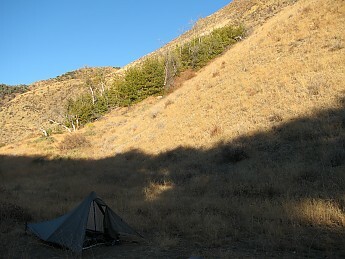 The TarpTent Contrail is a good single-wall shelter that provides rain and bug protection. Very lightweight and roomy for one person. Requires practice when setting up. Silnylon tends to sag when wet. On a trip last year, I was offered the chance to borrow a friend's TT Contrail. I was excited to finally have the chance to use this tent and see it in action. On this trip, we were expecting rain and cold temps down to the 20's. When my friend handed me the packaged tent, I was immediately amazed how small and really light this was. At first glance, I seriously thought I was being handed a tarp and not a full 3 season tent with bug protection! 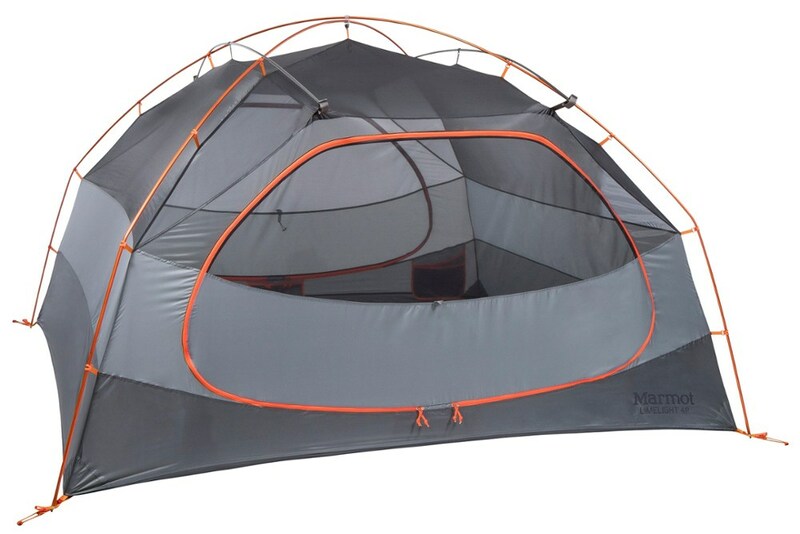 At 24 oz., this tent is amazing and in my opinion, packed with features, the same features you would find on a double-wall tent. Arriving at our camp for the evening, I was very eager to setup this tent. I can tell you this much, it's a good idea to practice setting this tent up at home first. It took me a good 15 minutes to finally set up the tent...even after watching many online videos on how pitch this shelter, a hands-on feeling and practice was definitely needed. The idea of how to pitch the tent wasn't the difficult part for me, it was getting the fabric taut enough so it didn't sag. I had to readjust the pitch, tighten guylines, etc., just to get the pitch correct. After getting the pitch just right to where I was happy, the tent looked great. Here's a shot of the tent prior to tightening the guylines..
That evening, rain never came, so I am unable to tell about how this tent handled rain. However, I would imagine it would handle just great. I did experience frost on the outside of the tent which caused the fabric to sag overnight. The foot area of the tent became really close to my sleeping bag making the shelter look like a hooped bivy the following morning. 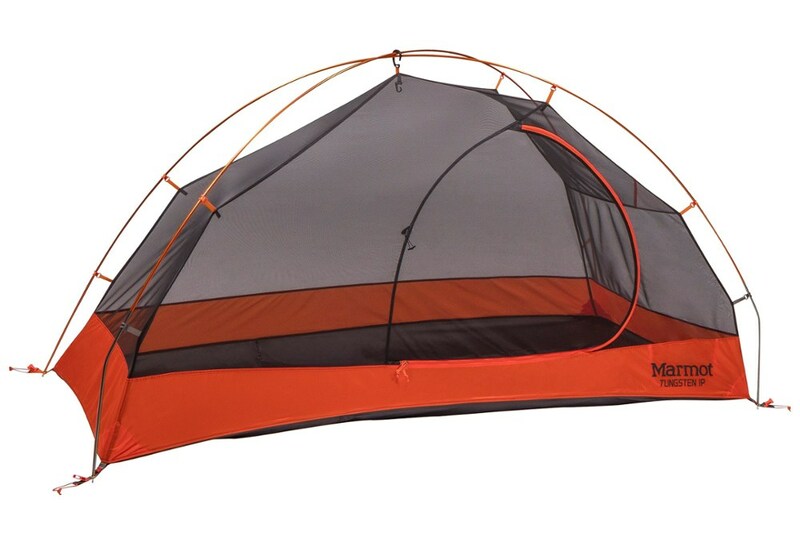 Based on my overall experience, however, I still think this is a great tent but you will definitely need to practice setting this shelter up in your backyard or park prior to a trip. There is a learning curve when setting up these shelter types. I would recommend this shelter to anyone looking to lighten their load and for someone who's looking for a roomy one man shelter. The Contrail is an excellent shelter for the long-distance hiker. So far I've used mine for 3300 miles over the last two seasons, and it's still going strong. This year I thru-hiked the Appalachian Trail in the Eastern US. Last year I hiked 1100 miles on the Continental Divide Trail in the Western US. The Contrail provided excellent shelter in heavy rain with moderate-to-strong winds, moderate hail, and light snow (2" or less). And it provides very good bug-free ventilation. I've never slept as well in harsh conditions as I have in this tent. 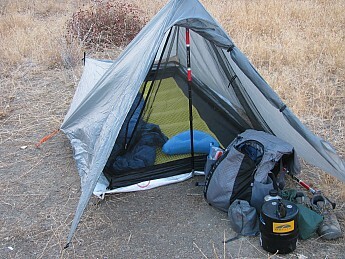 It's important to keep in mind that this is a lightweight silnylon shelter and it has its limitations. The user needs to be aware of condensation and misting issues. Site selection is very important. 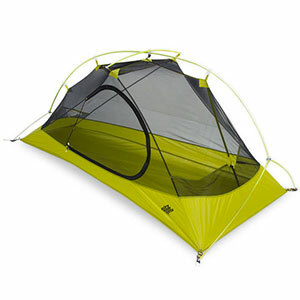 I would not recommend this tent for an inexperienced weekend hiker in heavy rain, for instance. But for an experienced long-distance hiker, I haven't seen a better shelter. It's easy to pitch with only 4 stakes (but it takes a week or so to get really good at it), it's lightweight (23 ounces without stakes), easy to pack (no poles if you use a hiking stick), adaptable for different conditions, and there's nothing to break (again, no poles). This is the third Henry Shires tent I've owned. I wore out the other two. I haven't needed help with the Contrail, but I was always impressed with the company's customer service. Ease of Setup: very easy, put trekking pole in place, pull out front corners and stake out, pull out back corners and stake out, adjust as needed. Weight: 28 ounces including 4 aluminun stubby stakes or titanium stakes, not including stuff sack, which I do not use. Have used Contrail since last summer and have experienced the spectrum of weather. From hot and humid on the Maryland AT to a wind-driven, hail storm in Otter Creek Wilderness in WV. Very easy and quick set up, less than 5 minutes. When the thunder is booming, very weather worthy. Despite user error (left flap half open when retrieving a jacket), the Contrail kept my gear pretty much dry. A little rain blew in the partially open flap, but my down bag stayed surprisingly dry despite the hard wind, hard rain and hail. I enjoyed the great ventilation on a very hot and humid hike of the AT in Maryland in Sept 2007. Very lightweight, about 27 ounces including mini-biners attached to the guys for quick set up. Plenty of room for one person, a dog and gear. Easy to adjust the pitch to the weather conditions. I recommend the Contrail for overnight hikes or longer hikes. Seems well made and well thought out. Great tent. Setup is a breeze, even I did it the first time in the dark in about 5 minutes or less. Great air flow. All the benefits of a tarp style tent but with the protection of a normal tent. Love the fact that bugs can't get in. Big enough for one person and a 3000ci pack inside and out of the rain. You do have to use an adjustable trekking pole for the front, but if you are already using poles then you might as well use them on your tent at night. 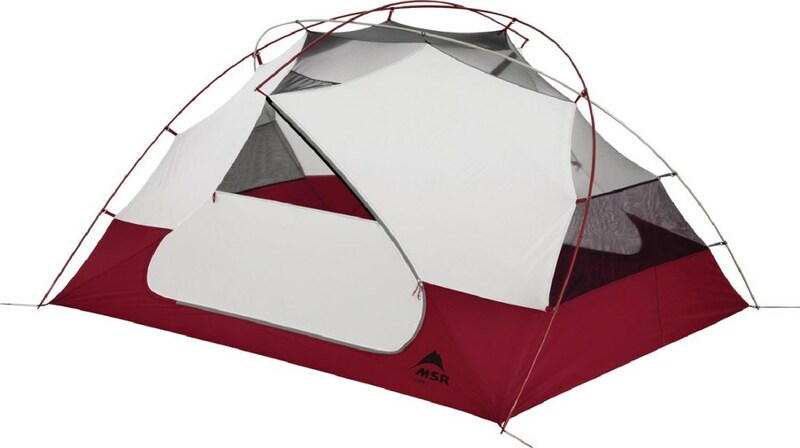 If you are looking for a superlight tent that still gives you the comfort of bug netting and full coverage then it's hard to beat this 24.5 oz tent. Lightweight - Under 2 lbs! The Contrail is a super lightweight, single wall, one-pole (trekking), 4-stake tent that weathered a variety of weather conditions. It has become my primary backpacking tent. The first time I set it up was a bit tricky and it took me about 10 minutes to get the proper tension and pitch. The second time I set it up I was able to cut the time in half. After a few days I was able to trim the set up time to a few minutes. Since it is not free-standing, the biggest hurdle is finding spots where there are no rocks to make sure you have a secure base. 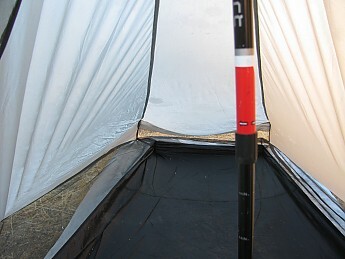 On the sides of the tent are two loops where additional guy-lines can be attached to increase circulation and floor space. With three sides of mesh and a large zippered screen door, the Contrail provided many nights of well ventilated and bug proof evenings. NOTE: You must seal the seams prior to using it. I used half a can of silicon spray to cover the seams. Welcome to Trailspace, Bivouac! Thanks for sharing your Tarpent review. Welcome to Trailspace. My backpacking buddy uses one of these and he loves it. Difficult to set up, needs a lot of space. Difficult to set up without a lot of prior practice and it needs a lot of space. 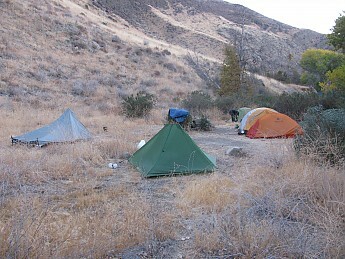 Many nice campsites were off limits due to the area needed for the tent and lines. The tent blew down in moderate winds and was very wet inside. Welcome to Trailspace, Ken. How much space did you need for your Contrail? 12 feet by 6 feet stake to stake. Actual weight is heavier than the stated weight. Tarptent lists the weight as 27.5 oz. The actual weight of the tent, four stakes, and the stuff sack is 32 oz. If you get the Tyvek ground cloth add another 5 oz. I'm not sure how much weight the seam sealing will add to the weight of the tent. 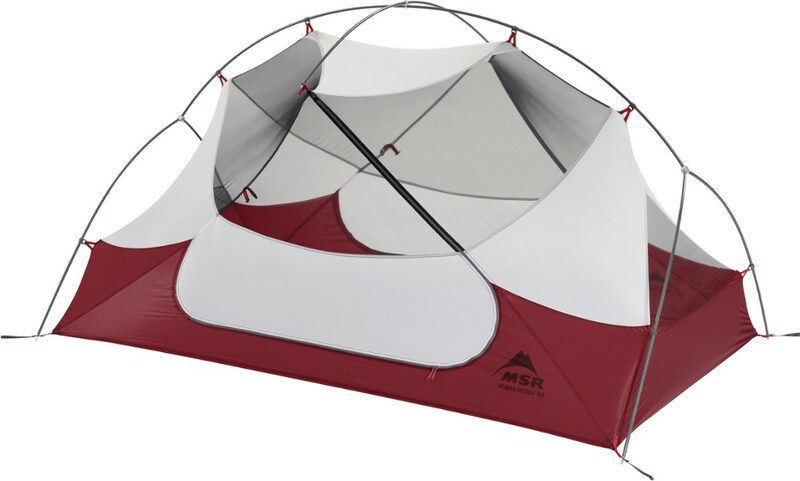 Roomy, easy to pitch, backpacking tent with a sub 2 lb weight. Have used this tent for years all over the Smokies, can't say enough good things about it. 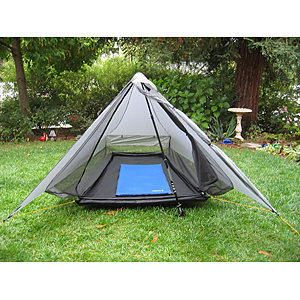 Very roomy, have never had a condensation problem, sub 2 lb wt, very easy pitch [can use no front pole, a hiking stick or a light weight pole you can buy from Tarptent]. I like to use a front pole for a tighter pitch, not free standing but have never had a problem pitching in the Smokies. Of course sil gets a little droopy when wet, but I use a very lightweight shock cord at each end of the tent to take up slack, thanks. 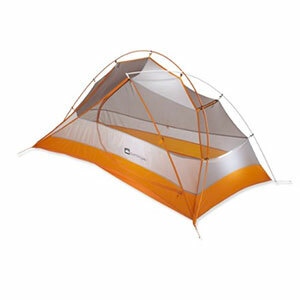 The Tarptent Contrail is not available from the stores we monitor.